Small business account application experience. Up to this point, there was no online tool from any bank that would enable you to setup and start using a new business account immediately online. The process usually consisted of you visiting the bank on multiple occasions with a stack of documentation about your business. This was time business owners could not afford and it was a huge inconvenience. We also had to keep in mind that we also had a business metric we needed to fulfil which was to increase small business account openings specifically online. As the User Experience Designer, I focus on the improvement we are making to the users’ lives and let the business goal be a benefit that comes along with that. I believe if we serve people properly, the business will follow. As we got deeper into the project, we realized that we would need to create a front-end application for customers as well as a back-end tool for small business advisors to follow up with customers and help them through the process if needed. There are many steps when signing up for a small business account at a bank and many back end checks and services to contend with. If one of these services were down or information got entered incorrectly, we would need to provide a way for an advisor to help the customer complete their process in order to ensure the best customer experience. We started out designing the customer journey we would like to provide and then began looking at how the advisors’ interface would need to work to best serve our customers. What technology would be best to use etc. To design the service, we ran ideation, user testing and interview sessions with customers and advisors. We discovered that the logical flow and needs for the customer were not the same for advisors. The customer interface was linear - if this then that sort of flow - and visually simple. Tasks were broken up into pages. It was a pretty lengthy and complicated application to complete and we wanted to make it as simple as possible. The advisor experience was tabular and allowed advisors to hop back and forth throughout the application. The advisors needed this ability so that they could check where a user may have gone wrong or if a service was down etc. We completed the first phase of this service and launched it into the market. 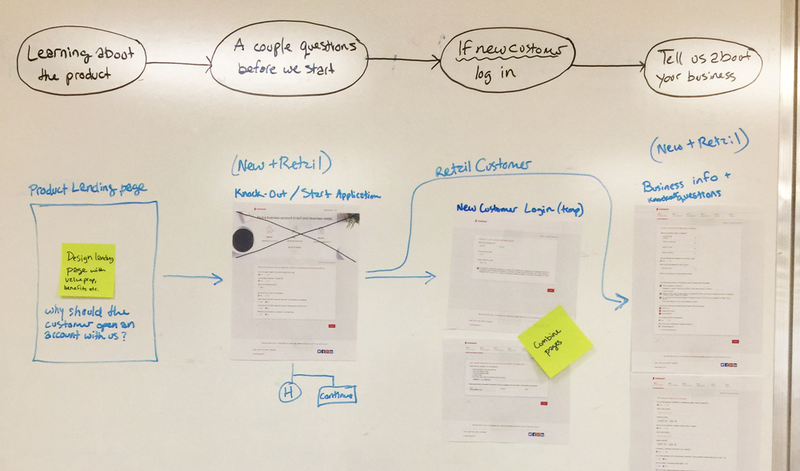 We kept track of what was happening online and with user testing we continued the iteration - build - test cycle. Here's a link to the current customer facing on-boarding flow. To ensure everyone has access to input, one of the techniques I use is to display the work on a whiteboard and open it up for all stakeholders to understand, influence and contribute. A concept drawn on a white board is not set in stone. There is still opportunity to change, suggest other ideas and influence. I like to propose my concepts to my team mates and stakeholders so they can be part of the design process. To ensure everyone understands what is happening at any stage in the application from the QA, Product owner, developer and myself, the UXD, I try to document the full system flow (what is happening on the front-end and back-end) at any given time. On the project wish list was an managers dashboard so manager could track their advisors workload and the applications coming in. They wanted to see application pending too long, who was their star performer etc. I ran a session with this group to help them identify what they needed.